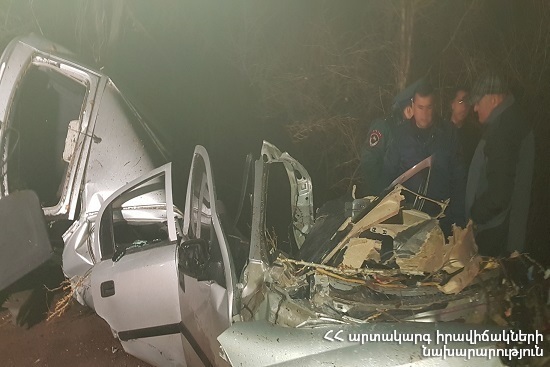 On April 16, at 23:25 information was received to “911” service that a car accident had occurred on Yerevan-Sevan highway near Kaghsi village of Kotayk province: there was a casualty, the rescuers’ help was needed. It turned out that “Opel Astra G” car had run off the roadway and crashed into trees on the 38th km of Yerevan-Sevan highway. The driver (A. P. born in 1980) died on the spot. The rescuers disconnected the automotive battery of the car, took it back to the roadway, removed to the tow truck and moved the corpse of the driver to the ambulance.